In Sunny Hillride you journey on a turbulent and crazy family holiday, and even your pet parrot is on board! Put the pedal to the floor and let your car and bus fly across hilly, colorful landscapes of forest, desert, snow and meadows. Make sure you don't run out of gas, and don't lose your luggage doing daredevil stunts – the roof of your RV is piled precariously high. Suitcases, bags, the birdcage and your fellow travelers must arrive safely at the holiday resort; otherwise you won't get the full score. Tons of rewards await you as you cross hills and valleys. Try not to miss any of the coins and souvenirs lying around. 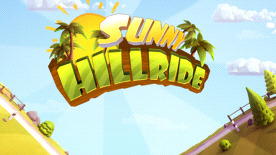 Sunny Hillride is a fun journey with the whole family, full of adventure, fun and speed!